Before they bury them, they stuff them with grass and moss, and then wrap them all up. That’s where the mummies come from, and ladies start making burial masks for them. Household goods, drums, and masks were placed in dry burial caves with the carefully prepared bodies of chiefs and other important people, for them to use in the afterlife. This storage bowl from Kagamil Cave in the Islands of the Four Mountains is between 500 and 1000 years old. 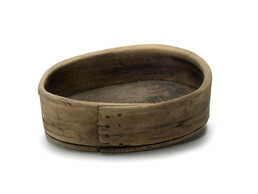 It was made by heating and bending a shaved plank of wood to make the oval rim, then adding a solid piece of wood for the base.